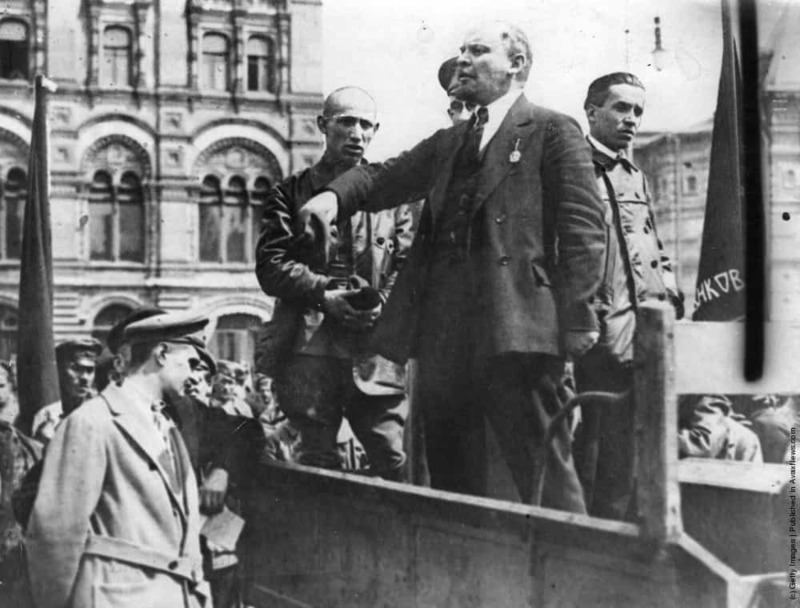 At a time when the appeal of and demands for a new “democratic” socialism seem to have caught the imagination of many among the young and are reflected in the promises of a good number of political candidates running for high office, there is one already-existing socialist institution in America with few opponents: the Federal Reserve System. The fact is, central banking is a form of central planning. The Federal Reserve has a legal monopoly over the monetary system of the United States. It plans the quantity of money in circulation and its availability for lending purposes; and it sets a target for the annual rate of price inflation (currently around 2 percent), while also intentionally influencing interest rates, affecting investment spending, and supporting full employment. Almost all discussions and debates concerning the Federal Reserve revolve around how it should undertake its monetary central planning: which policy tools should be used, what target goals should be aimed for, and who should be in charge of directing America’s central bank. A complementary issue that has received renewed attention concerns the question of how much “independence” the Federal Reserve and other central banks should have to determine and implement monetary and interest rate policy. This has recently come to the fore due to comments made by President Donald Trump concerning Federal Reserve interest rate policy and the individuals he has recently proposed for positions on the Federal Reserve Board of Governors. Several times over the last year, President Trump has expressed irritation and frustration with increases in market rates of interest under the Federal Reserve Board leadership of Jerome Powell, who Trump nominated for Fed chairman and who has held that position since February 2018. In the financial world, those who subscribe to the contrarian school of thought (including myself) keep an eye out for certain cues or indications that a trend has become overcrowded and is nearing its end. Some examples of these contrarian indicators are investor sentiment indexes, fear gauges such as the CBOE Volatility Index or VIX, the construction of record-breaking skyscrapers, and also the topics that are chosen for finance and business magazine covers. The last example is called the Magazine Cover Indicator and the logic behind it is that, by the time a trend has gained enough momentum or attention to justify its own cover story, it is about to become passé. In an infamous example, Businessweek published the cover story “The Death Of Equities” on August 13, 1979, right before the secular bull market began. Bloomberg Businessweek’s latest cover story is called “Is Inflation Dead?,” which should make contrarians question whether the actual risk is higher inflation (or hidden inflation, as I will explain). If economics were literature, the story of what happened to inflation would be a gripping whodunit. Did inflation perish of natural causes—a weak economy, for instance? Was it killed by central banks, with high interest rates the murder weapon? Or is it not dead at all but just lurking, soon to return with a vengeance? The Fed and major central banks believe they are fighting a deflationary spiral battling ongoing misses to their inflation targets. But in truth their misguided policies are contributing to a depopulation spiral. They are forcing low interest rates that only exacerbate overcapacity for a consumer base among whom growth is fast decelerating. The cheap money is causing rapid asset appreciation absent like wage growth. Asset holders (primarily older and wealthy) are reaping the rewards while those with little or no assets (young, poor, those of childbearing ages) are paying higher rents, insurance, medical care, schooling, etc. etc. This inequitable inflationary pressure is pushing birth rates to all time lows and cutting off present and future demand…and this is met with even more of the medicine that made the patient sick in the first place. From a US perspective, there has essentially been no bottom up US population growth since 1950. Chart below shows average annual US births per decade (including births from all sources, legal and illegal). Lower boxes show current age of the population borne during each decade. Births have essentially been flat for seven decades. 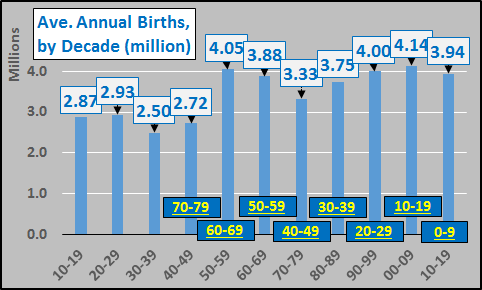 Average annual births per each generation and current age of each group, below. 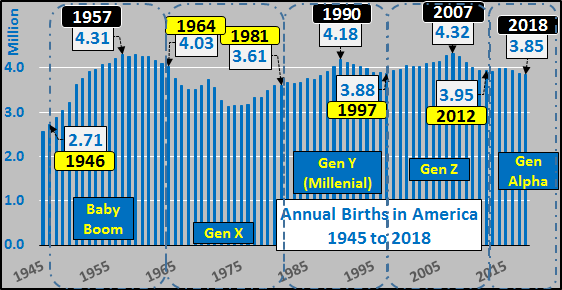 Again, births by generation have been flat since the completion of WWII. 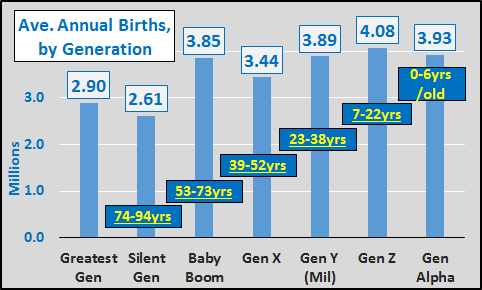 Below, annual births highlighting each generation. From the early ’50’s to present, births have been remarkably flat, given the tripling of the total population. Through 2030, the working age population is estimated to grow by less than 4 million versus 19 million more 65+ year olds. The result is that the US is currently at full employment with little further labor force growth available, detailed HERE and HERE. In the Hoisington First Quarter Review, Lacy Hunt blasts MMT as “self-perpetuating” inflation. Please consider the Hoisington Investment Quarterly Outlook for the first quarter of 2019. Under existing statutes, Fed liabilities, which they can create without limits, are not permitted to be used to pay U.S. government expenditures. As such, the Fed’s liabilities are not legal tender. They can only purchase a limited class of assets, such as U.S. Treasury and federal agency securities, from the banks, who in turn hold the proceeds from this sale in a reserve account at one of the Federal Reserve banks. There is currently, however, a real live proposal to make the Fed’s liabilities legal tender so that the Fed can directly fund the expenditures of the federal government – this is MMT – and it would require a change in law, i.e. a rewrite of the Federal Reserve Act. This is not a theoretical exercise. Harvard Professor Kenneth Rogoff, writing in ProjectSyndicate.org (March 4, 2019), states “A number of leading U.S. progressives, who may well be in power after the 2020 elections, advocate using the Fed’s balance sheet as a cash cow to fund expansive new social programs, especially in view of current low inflation and interest rates.” How would MMT be implemented and what would be the economic implications? The process would be something like this: The Treasury would issue zero maturity and zero interest rate liabilities to the Fed, who in turn, would increase the Treasury’s balances at the Federal Reserve Banks. The Treasury, in turn, could spend these deposits directly to pay for programs, personnel, etc. Thus, the Fed, which is part of the government, would be funding its parent with a worthless IOU. As we noted at the time, one month after the PBOC injected a gargantuan 4.64 trillion yuan ($685 billion) into the economy – more than the GDP of Saudi Arabia – in the month of January in the country’s broadest credit measure, the All-System Financing Aggregate a credit injection that was so massive it even prompted the fury of China’s prime minister Li Keqiang who lashed out at the central bank for its unprecedented debt generosity in a time when China was still pretending to be on a deleveraging path, in February the PBOC again surprised China-watchers, this time to the downside, when the Chinese central bank reported that aggregate financing increased by a paltry 703 billion yuan, roughly half the expected 1.3 trillion, the lowest print in the revised series history. 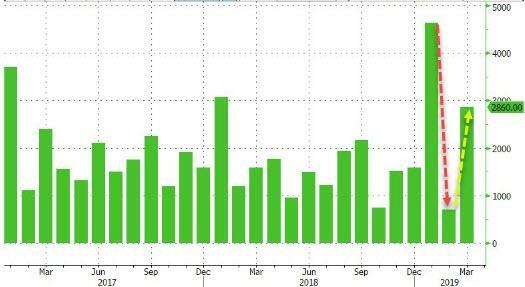 However, to assuage fears that China was turning off the credit taps just one month after the release of weak February TSF, PBOC governor Yi commented in his press conference during the NPC that (although February TSF data was weak) the data should be viewed in light of strong January data. He also noted that even combined Jan-Feb data could be distorted by the Chinese New Year, and one needed to wait for March data. Well, we got just that overnight (as reported previously) and it was a monster: just after 4am ET, the S&P futures surged above 2,900 when the PBOC reported that in March, new yuan loans jumped by 1.69 trillion, far above 1.25 trillion estimate, while total social financing in March soared higher 2.86t yuan, the highest March increase on record; smashing the 1.85 trillion yuan estimate, and more than four times the February 703BN yuan increase. This is all going to end badly, even some ardent bulls will freely admit this, the question is the how, when and the where. Frankly it’s a tragedy that’s unfolding and discerning eyes can see it. Since the December lows markets have taken the scripted route higher salivating at the prospect of dovish central bankers once again levitating asset prices higher. A Pavlovian response learned over the past 10 years. Record buybacks keep flushing through markets and cheap money days are here again as yields have dropped markedly since their peak last fall. But investors may sooner or later learn the hard way that this sudden capitulation by central bankers is not a positive sign, but rather a sign of desperation. 10 years after the financial crisis is there any conceivable scenario under which central banks will ever normalize balance sheets to pre-crisis levels? 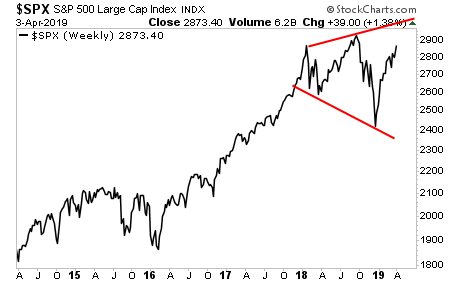 The capitulation is as complete as it is global and 10 years after the financial crisis there is not a single central bank that has an exit plan. As today’s Fed minutes again highlighted: No rate hikes in 2019 while the tech sector is making a new all time human history high this week. What an absurdity. A slowing economy ignored by markets as cheap money once again dominates everything. For most economists the Keynesian remedy is always viewed with positive benefits- if in doubt just push more money and boost government spending to resolve any possible economic crisis. An example will illustrate how initial spending by the government raises the overall output by a multiple of this spending. Let us assume that out of an additional dollar received individuals spend $0.9 and save $0.1. Also, let us assume that consumers have increased their expenditure by $100million. Individuals now have more money to spend because of an increase in government outlays. There is nothing that a human mind can’t conceive. It can shoot for the stars or dive in the ocean which twinkles in the shadows of stars and ascend back with sparkling mind bearing uncanny ambition only to float contended. Today, we live in fear of losing wealth, we worry what economic consequences would do to our cash, we look through a microscope and scrutinize every word, every policy, every regulation or find something to put above ‘every’ and list out the glaring negatives with a slight trace of approval. If only one could notice the lens of the microscope, would then one could tell reel and real apart. Such is the case of negative interest rates. It is dealt differently by different flock of loaded individuals, generally in ways which would not only prevent losses but essentially gain cash. This flock stands on one side of the transaction contemplating means to win regardless of the loss that still deliberating other doomed flock endures. Well, this is how the world works. It is a Bernoulli trial. But there exists a splash of humble wit folks floating beneath the starry sky delighted by the victory of each one and beaten down none. Theory? Without thinking too much, negative rates indicate that the economy is unable to generate sufficient income to service its debt. Almost always, all roads leads us back to debt sustainability levels. In order for an economic system to reduce debt, it requires growth or inflation or currency devaluation. For an economic system to exercise one of the two (growth not included), capital transfer is to be facilitated. This capital movement in negative rates environment is from the savers to the borrowers. Your invested value, the money you gave to borrowers would have a value lower than the face value. Barbaric! Savers should be the winners not the borrowers! Central to the vision for a fully digitised global economy is the intent to reform national payment systems. The UK uses the Real-time gross settlement (RTGS) system, which the majority of payments in Britain are facilitated through. The Bank of England’s Victoria Cleland has emphasised on numerous occasions that the ‘fundamental renewal‘ of the system is being carried out through choice rather than necessity. This would indicate that RTGS works fine in its current manifestation, but the BOE (along with the European Central Bank) have been tasked with assuming more control over their respective payment systems. 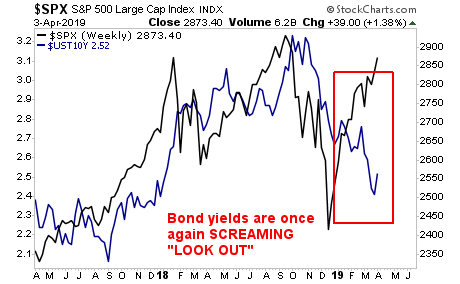 That is the environment in which the economy is weakening, but investors are pouring into risk assets based on hopes that Central Banks will engage in more stimulus. This is precisely what happened in the late ‘90s as well as in late 2007-early 2008. Will the outcome be different this time? In the near-term, traders will gun the market to new all-time highs. We’re too close for them not to. And until institutions start selling in droves again, we’re in a “trader’s games” market. This means north of 3,000 on the S&P 500. This doesn’t make sense… but markets never make sense during bubbles. The bigger issue is what comes after that breakout to new all-time highs. And THAT is where you need to be worried. I’m not talking about a 41% gain on a single trade… I’m talking gains of 41% per year on the ENTIRE portfolio. Just yesterday we locked in a 20% gain on a trade we held for only two days. With this kind of track record, we’re closing the doors to new subscribers soon. There are currently fewer than 3 slots left for potential subscribers. …And they are doing it now too. So enjoy the rally while it lasts, but don’t be fooled. What’s coming won’t be pretty. And if you’re interested in profiting from it, the time to prepare is now. By purchasing increasingly worthless paper assets, we can thank the central banks for propping up the global economy for the past decade. Since the 2008 financial crisis, the top central bank’s have acquired $13 trillion worth of assets on their balance sheets. While the central banks label these balance sheet items as “Assets,” they are nothing more than glorified Paper IOU’s. And these trillions of dollars worth of paper IOU’s can only get their value from the burning of energy… a critical factor overlooked by mainstream financial analysts. Without growing global oil production, most of these “supposed” assets would see their values plummet. Unfortunately, the world is heading towards a collapse of global oil production due to the Falling EROI – Energy Returned On Investment and the Thermodynamics of oil depletion.